My name is Ify, pronounced E-fee. I’m a Muslim woman, AfriYorkan (part African, part New Yorker, fully American). I’m from New York and my parents are from Nigeria. A nurse, reader, budding photographer, recovering news junkie, and trivia buff. Liberaldox, a writer and an activist with a passion for justice. 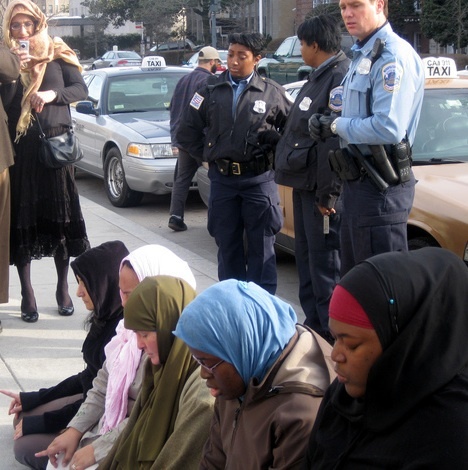 My friends and I praying on the sidewalk outside the Islamic Center of Washington after risking arrest for praying in the main hall. Ameen. May Allah subhanahu wa ta ala have mercy on you and reward you with that which is best. salam…saw ur comment on my new blog… i am afraid this blogging will get addictive… btw i have a new post on the 2006 election…. i see that u go to dar-us-salam… i was there on saturday with my family.. maybe u met w/my wife… she was wearing a black burqa/niqab with 3 kids… one very cute baby, we were out-of-towners of course… we LOVE that community. unfortunately, as much as we would like to, the logistics of my work wont allow us to move there (at least not yet). Yes, blogging can become addictive. I may have seen her but can’t recall. I came early and then some sisters invited me their homes so I left but I came back for Br. Safi’s lecture in the evening. May Allah make it easy for you and your family. I love that community, I always feel a sense of sakinah as I pull into the parking lot and sad when I drive away. Which reminds me, I need to update my own blog. See you on Friday, insha’Allah. Alhamdulillah springRoll. Aren’t you going to give us that link for your blog? as salam alykum. i know i am supposed to have a website to be here but i just couldn’t resist sending a reply o my sister who is from nigeria. i am also from nigeria and in fact i live in Lagos, nigeria. also i just stumbled on this site and i fell in love with it. i hope to gain from it inshaallah. i’m also a memeber of the almaghrib community forums though i am not very frequent there. soooooooooooo…………….. wa salam alaykum. I hope, Insha Allah, your favorite movie is fulfilled. Nigeria, like all of Africa is a part of me; it’s a pleasure reading from one from there. You go to Dar us-Salaam, too? So do I! My little one goes to Al Huda. I used to teach there and am praying that Allah will allow me to work among the Muslims again. It’s one of the few communities that is relatively fitnah-free. Not perfect, but , masha Allah, the Muslims greet me there warmly no matter if we’re dressed differently, unlike some paces you go. I know a Nigerian sister there..maybe it was you I used to sit next to in Qur’an class…? Yeah Umm Atiyya, I miss our weekend Quran classes and the camaraderie and sisterhood of reciting in our small group and listening, learning, and correcting each other. Maybe we could get together again just to recite. I would love that! I intend to continue classes this coming September with our dear teacher. But I would welcome the opportunity to get together with you since I haven’t seen you since the Chain of Command class. I’m supposed to have my own web site to be on here? …My bad. I’m new to blogging and have spent WAAAAY too much time on Umm Adams’s blog, but I really enjoy hearing about her life. Makes me think I’m in/wanna go to Saudi. But the non-driving thing hangs me up. Man, I used to ride motorcycles and enjoy the wind flapping my khimar out the back of my helmet! Can’t drive?!!! Oh, well, hijrah should be for Allah, not the gas pedal. Btw, my favorite is nice, crisp Gala with a hunk o’ cheddar chese! My sincerest apologies for overlooking some of you. Soul Purity: I hope you find something beneficial here, one of the few reasons I don’t delete this blog is because people tell me they have benefited from something I’ve posted. Omar: Ameen and the same for you. Irving: Ahh, I would love to hear about that movie and thanks for adding me to your blogroll, you’re in my Google Reader so I can keep tabs on your posts. A belated Eid Mubarak to you. I saw you tonight and I remember the sheikh mentioned the thing about telling someone you love them for the sake of Allah. And I wanted to tell you that I love you for the sake of Allah. Mash’allah I always feel you have sakeenah. I hope that is always the case with you insh’allah! Asalamu alaykum Naureen, and indeed I love you for the sake of Allah as well. Ameen to your dua. May Allah subhana wa ta ala protect you and envelop you in His mercy and shower His blessings upon you. Ameen. O Allah, make me better than they know and forgive me for what they do not know. Salam. I like the simplicity of the theme you’re using. Your posts are nice too. Thanks, I’ve been through quite a few themes and would be happier if I had a sidebar on the right or left instead of on the bottom. Hey, Sara, I think you copied me, but it’s all good, hope to see you up there some day in sha Allah. Clicked on your blog today. Solange & Silentside: Welcome to Muslim Apple, thanks for stopping by and for kind words. 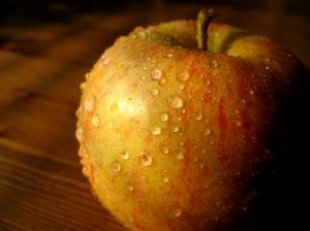 Congratulations on your marvelous blog Muslim Apple! Sadly, Microsoft Office 2008 is no better than the previous 2004 edition in terms of Arabic support but Apple’s Pages software is much better although far from ideal in terms of their Arabic support. Try their free 30-day trial. Thanks for stopping by the blog. Great name! I know that you know that we both know I am the reason we lost that match. I stumbled upon your awesome blog in randomness then I realized I believe I have been to it before but I didn’t have a clue it was you till I met you this past week, Nifty! May Allah ta’ala bless your blog and make it a means of spreading khair to the masses, Ameen! Wa alaykum salaam wa rahmatullah Rimza!!! La hawla wa la quwatta illa billah. Did I ever tell you that I find it rather embarrassing to know that people I know are reading my blog? Doesn’t make much sense, I know, just the way it feels 🙂 I was going to say on the forums that I’m glad I finally got to really meet and hang out with you on the last day on the ride back from the banquet hall. Glad you liked the ginger chew, hope the scary ginger root pic didn’t put you off. Hi! I’m writing you on behalf of the Protection Project. We are collecting some insights from Islamic bloggers on the position of Islam regarding Human Trafficking and we’d love to know what you’d have to say about the topic. What is your opinion regarding the stance of Islam on trafficking and exploitation of women, children and domestic workers? Thank you very much!